Taken this past weekend at a friend’s cottage, walking in the woods, where a bunch of largeish monarch caterpillars are fattening themselves up on milkweed in preparation for metamorphosis. Look at the size of that thing! Also, they’re soft, if you’ve never tried petting one. Velvety. Given that it’s august and the monarch migration to Mexico begins in late August each year, this caterpillar will fly south thousands of miles after its metamorphosis is complete. No one knows how the migratory route is transferred from one generation to the next. Milkweed plants are poisonous, and monarch caterpillars become poisonous from eating them–an advantage they retain after transforming into butterflies. This explains why monarch caterpillars have such bold colouring compared to the larvae of other species, which tend to be camoflauged. And while most adult monarchs will live for four or five weeks, those who reach maturity in the migration period can live for eight or nine months and won’t reach sexual maturity or breed until after the wintering period in Mexico. This Hinterland Who’s Who page has some great basic information about monarchs. Evolution has done some amazing things with life on this planet, eh? There is no other insect species in the world thought to have this multi-generational migration pattern. 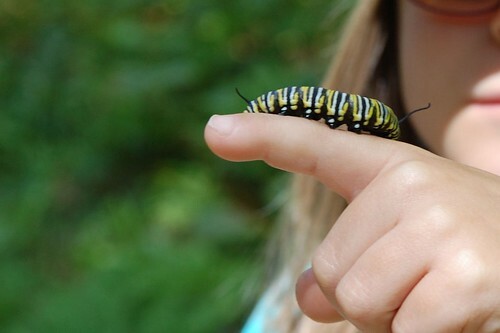 Regardless, kids love caterpillars. If you find a large stand of milkweed plants right about now, you stand a good chance of finding some, or maybe even a chrysalis or two. Or head to Point Pelee National Park in September to see the peak migration first-hand.